Switches also pre-date a lot of the other devices we commonly associate with Pinball, like Flippers, Thumpers, Slingshots, etc. and most machines today still use some manner of the traditional wire-form activated leaf-switch we find on older games. The focus of this blog is on solid-state based Custom Pinball Machines, and one advantage with SS when it comes to switches is that they can be scanned as a matrix. Most SS games since the 70’s have used this technique. With matrix scanning, you can read 40 switches with 5 drive lines and 8 read lines (5×8 = 40), but only use 13 digital I/Os (5+8 = 13). And just to hammer home the math, that saves 27 I/Os (40-13 = 27), putting this in the wheelhouse of a small micro-controller board like the Arduino Uno. 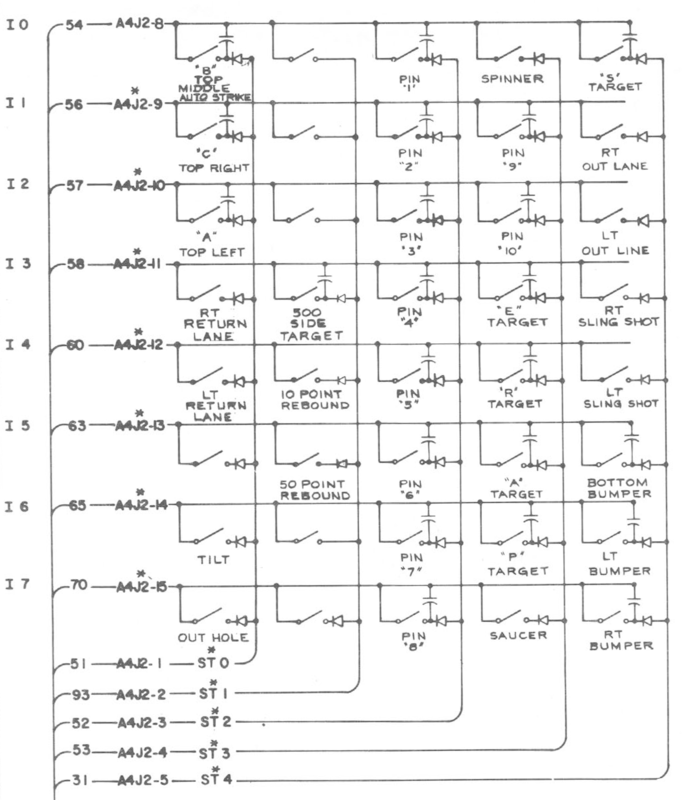 Here’s a typical schematic (below) of a switch matrix from a standard Bally 70’s solid-state (SS) game. I present this because it will serve us well even today since the principles are the same. Schematic of a switch matrix designed to be scanned by solid-state electronics. For our Custom Pinball Machine, we will use a micro-controller like the Arduino Uno. All the drive lines are initially held low. The first drive line is switched high. Each of the eight sense lines are read. These values then represent the state of switches 1 thru 8. The first line returns low, and the second line goes high. Again, read in the eight sense lines. These values become the state of switches 9 thru 16. Notice that each switch in the schematic has a diode on the drive side. This prevents “ghosting” in the case of multiple switches being active at the same time. Without it, the current from one drive column could back-feed through any switches active on the same row, in essence driving a second (unintended) column. An active switch on the second column would create a “ghost” activation on the first (real) drive column. Below is a spreadsheet I usually create during the design of the game, and reference for the assembly and wiring. Excel spreadsheet showing switch signal names with drive wire colors and sense line colors. Most older games made use of two-color striped wire, so there was never a duplicate color combination for any signal. In our case, it’s more feasible to use a limited set of standard colors, and just keep track of where there might be duplicates. I always create a chart like this early on, giving the switches logical names and grouping them based roughly on where they will be located on the playfield. It helps to use the same name later in the Arduino code that will be doing the scanning. Almost all older games use leaf-switches connected to a wire-form for activation. These usually have three contacts, and the diode mentioned above is mounted directly on the switch. This make wiring easier and more mechanically stable. This is a typical “spoon” switch used to activate Thumpers. 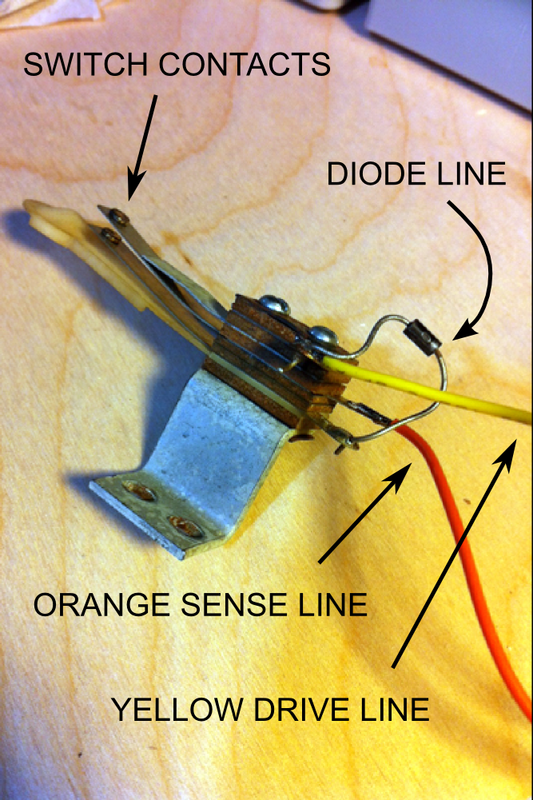 There is a built-in diode, with the drive wire coming in on the positive side (yellow), and a sense wire on the negative side (orange). Below can be cut-and-pasted into an Arduino project. Use this for testing and diagnostics, or as a reference for creating your own game code. It then rotates the state for the next loop so that current becomes previous. It only call the state “new” if it went low-to-high, you can change this in your own code. It implements a de-bounce timer function, which is adjustable, or just comment it out. Prints the “new” switch state to the serial monitor when switch is activated. This code will scan a 5x8 switch matrix and print the status of new switch states. -  Set the first drive line output. -  If state was low, and now high, set new switch flag. -  Send message out to Serial Monitor (optional). -  Loop through all eight inputs. -  Loop through all five drive lines. // if you are going to build on this as a game later.